Imagine being chronically hungry, continually longing for a bite to eat in order to temporarily satisfy your empty stomach. Top that off with being constantly exposed to the brutal outdoors, with several old, worn layers failing to retain the warmth of your body. Winter is rapidly approaching. In many places, the weather makes it feel like it’s already here. Imagine living without a consistent place to call home, and what it would be like to have to rely on options like street alleys, park benches, or emergency shelters from night to night. This is an oversimplified picture of being homeless during this time of year. There are technical, official definitions of homelessness, but it’s pretty self-explanatory: the state of having no home or permanent place of residence. Each case of homelessness is a crisis. In our country there are well over half a million people living on the streets, in cars, in homeless shelters, or in transitional housing programs. Some of the most recent statistics available come from a national survey conducted in January of 2015 where 564,708 people were identified as homeless. That figure included over 200,000 people with families, nearly 360,000 individuals, and approximately 140,000 homeless children. It’s shocking there’s not more of a rallying cry to act when this crisis affects hundreds of thousands of people domestically each year. While there are many who are working to help end homelessness and hunger, we must do more. Our actions or lack thereof are quite literally a matter of life or death. Homelessness is a complicated problem to address because it is the result of several factors, namely unaffordable or lack of available housing options, low-income families and individuals, loss of employment, racial inequality, domestic violence, and health challenges like addiction. The primary people affected are single adults, children and families, veterans, LGBTQ+ youth, and the chronically homeless who often times suffer from serious physical and mental health conditions. Our nation is so focused on the “American Dream”, but it’s about time that we start to discuss the “American Nightmare,” or the homeless crisis that we are currently facing. Homelessness is a nightmare because it is often times related to extreme suffering, as well as things like the opioid addiction crisis and severe mental illness, all of which are concepts that have sparked widespread (although not wide enough) dialogue. The causes of homeless can be linked to some of the most problematic aspects of our society. Being poor and powerless is never a desirable outcome. It’s a tragedy. I’ve seen this epidemic firsthand on many occasions, but it has only recently opened my eyes to this degree. I attend Ithaca College in Ithaca, New York where the homeless crisis is one of the most alarming in the area. The severity struck a chord in me over this last year as I’ve developed many friendships with homeless folks in the community and volunteered at my local homeless shelter. The statistics above aren’t what has shaken me to the core. Getting to know the faces battling the problem, building relationships with them, and listening to their stories has been a truly transformative experience. On any given winter day in Ithaca the weather app might say that the weather outside feels like -4 degrees with windchill. With their expensive winter coats, gloves, hats, scarves and various layers, the college kids at Cornell University and Ithaca College complain about the unbearableness of the freezing cold after being exposed for mere minutes in between classes. I admit, I am one of them. But the vast majority are completely unaware of what should be classified as a “Tompkins County State of Emergency” that many are braving every night in sleeping bags and tents. Little do they know that hundreds of people are not only bearing the weather, but are struggling to find a way to simply survive each day. The Ithaca homeless population is dying left and right. I've visited a place called the Jungle, an area where many people congregate who don't have a place to live. 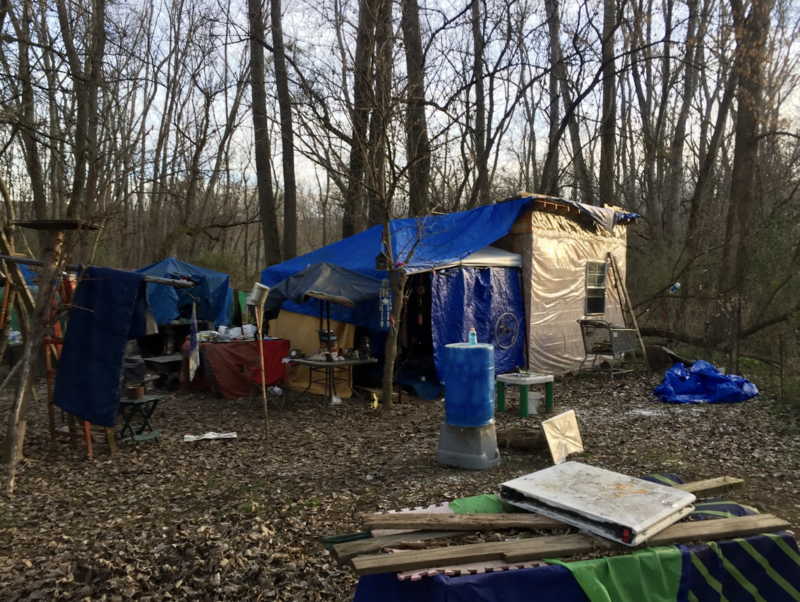 There are over 50 people living here in the woods with tents, forts or just sleeping bags. It's heartbreaking. Seeing this in person and getting to know some of these people living in these circumstances has sparked a passion in my soul to act. To not just sit on the sidelines and watch more cases of frostbite, more stomachs become empty, and more people die. Those involved in fighting homelessness are doing great work, but there are just too few people playing their part to assist their fellow human beings. I want to help change this. There are several popular misconceptions about homelessness. There are many who refuse to help “hobos” or “bums” because they’re “lazy,” “are getting what they deserve,” or “will waste the money they are given.” People are outright mean about the issue, taking to social media to bash those who are homelessness. If you don’t believe it, check out this this short video. The hatred and misunderstanding directed towards the homeless who fighting are for their lives under dire circumstances is inhumane, despicable, and disheartening. The stigma surrounding homeless individuals is also far from accurate. The homeless individuals I’ve gotten to know all have fascinating stories filled with joys and sorrows. Each have been hurt, each are fighting their own demons, and each wish that their circumstances were different. Many are hard working, independent people who just can’t find a break with a full-time job. They long for financial security and a place to have for themselves but are currently confined to part-time work opportunities. In college towns, often times many part time jobs are occupied by students, making it difficult to work for those who need the money most. I met a man named Eric who was laid off from his refrigerating job in Syracuse with dozens of others because the company was downsizing. He’s desperately trying to find an employment alternative. Last year I met another man named Gabe who has gone through various challenges, including a battle with addiction. He’s now dedicated to getting back on track and is a patient at a rehab facility at the time of this writing. Rental availability in the Ithaca area is less that 1%. Ithaca is the 8th most expensive place to live in the United States. There are simply not enough shelter beds. My friend Sinbad lives in a fort at the Jungle. He told me that there have been 20 deaths there this year alone. My friend Mike works as the Program Manager at the Rescue Mission, the homeless shelter in Ithaca. He said that last year the homeless crisis in Ithaca was the worst he's ever seen there, and this year alone it's 3 to 4 times worse. Action cannot be a suggestion, it’s required. These fellow human beings suffering in ways that are incomprehensible to the vast majority of us. Many of them are homeless because of circumstances well beyond their control. All of them hate their current situations. They need hope. They need love. I'm dedicating myself over the next several months to help these friends of mine who are down on their luck, especially as another brutal Ithaca winter is upon us. To put this issue in perspective, our country spent over 11 billion dollars in total with Black Friday & Cyber Monday combined on shopping for the holiday season. In a time where everyone is so focused on giving, why don’t we prioritize giving to the homeless too? After all, the average American's net worth is $68,828. There’s undoubtedly a surplus and room to give back. Shouldn’t the problem of homelessness stir up anger in our hearts a desire to get involved? Sacrificing a couple bucks towards relieving the issue of homelessness, if donated to the right organization, will translate directly into food for the hungry, shelter for those without it, and will help sustain despite serious challenges. Couldn’t this small act of generosity lead to systemic change? Join me in being dedicated to making a difference for the homeless crisis, both in Ithaca and across the United States. Let’s show kindness, generosity and love to our brothers and sisters who are struggling with homelessness. Do your part to inform people that homelessness is a complex issue and do your best to fight the stigma surrounding the topic. Do your small part to help end this nightmare and give the homeless shelter, food, and most important of all, hope. You can check out my latest Givebutter campaign to raise money before we face the brunt of winter in Ithaca, New York for the Rescue Mission, the underfunded homeless shelter in my college town that does phenomenal work and is on the forefront of fighting the crisis in Tompkins County, New York. Additionally, the National Alliance to End Homelessness, a nonpartisan organization, has ample resources for more information on this topic.